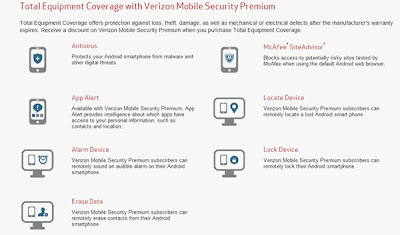 Verizon Wireless has released a mobile security Application for Android, in combination with McAfee antivirus, web-security protection and Asurians recovery services. There are news that this app will soon be available in Verizon preloaded Apps. 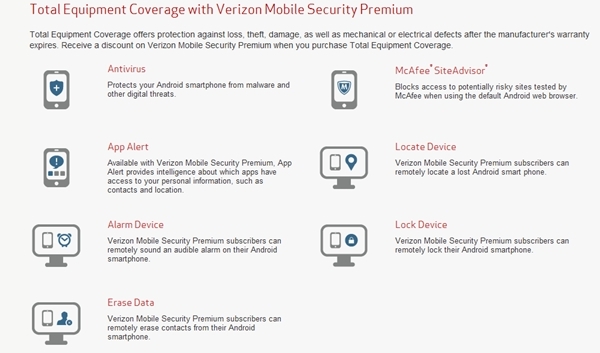 While Verizon Mobile Security is available on Google Play, there are two plans the Basic plan which is obviously free that has McAfee antivirus and web-security protection. The premium plan is of worth $1.99 per month that includes the entire basic feature and adds MacAfee alert-an app permissions advisor and recovery services by Asurians. When users loses its Smartphone, they can execute few commands after logging in the website to remotely locate the geo-location, wipes all data. Verizon clients by way of Total Equipment Coverage installed, a $6.99/month warranty add-on, can upgrade to Premium for $1 instead. Verizon will also be releasing versions for iOS and Blackberry in upcoming days.